The Xenoblade series has steadily grown into a RPG darling in the hearts of countless Japanese RPG fans. Xenoblade Chronicles and Xenoblade Chronicles X pushed the limits of Nintendo’s relatively underpowered platforms in unthinkable ways late into their lifecycles. 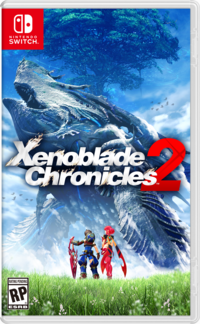 That’s why it is still a bit surreal to see a brand-new Xenoblade hit the infant Switch and with a simultaneous worldwide release on top of that to boot! Despite the Switch’s console-handheld hybrid nature, Monolith Soft has made no compromises to its vision of delivering ambitious RPGs. Xenoblade Chronicles 2 is a fantastic, worthy successor to the first Xenoblade Chronicles. It’s filled to the brim with what RPG players want - an excellent story, a lovable cast of characters, an exciting battle system, a phenomenal soundtrack and of course, an incredibly dense world to explore. Although XC2 is not a direct sequel to the first XC, it carries its torch on putting the story and its characters above all else. XCX, on the other hand, tucked away those elements on the backburner in favor of one impressively massive open world. It’s best to think of them like the divide over Mega Man and the Mega Man X series; they’re both unrelated to one another aiming for the same thing and present it in different ways. If you missed out on XC, worry not! XC2 has a few winks and nods to it, but it tells its own standalone tale with an all-new cast of characters. Long-time Monolith Soft supporters are in for several unexpected treats though. 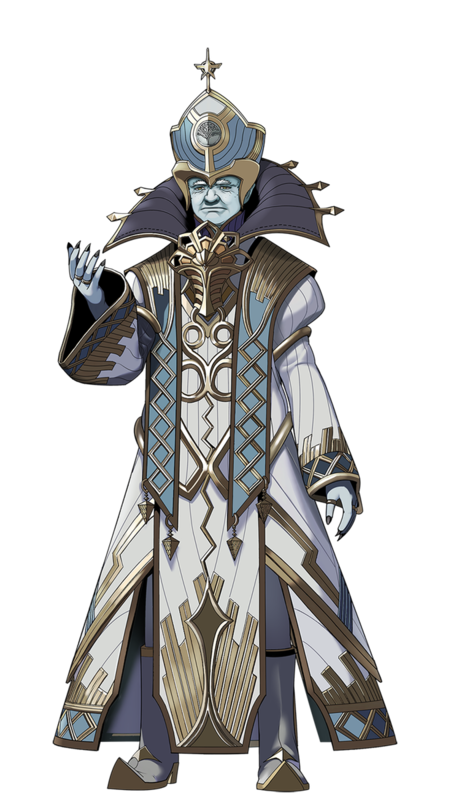 Xenoblade Chronicles 2 revolves around Alrest, a world that rests on top of the Cloud Sea where entire nations and civilizations are built among multiple colossal creatures, the Titans. It starts off with a typical boy-meets-girl premise; Rex meets Pyra in a twist of fate and soon find themselves on a journey to Elysium, a supposed land of paradise that sits atop the World Tree. 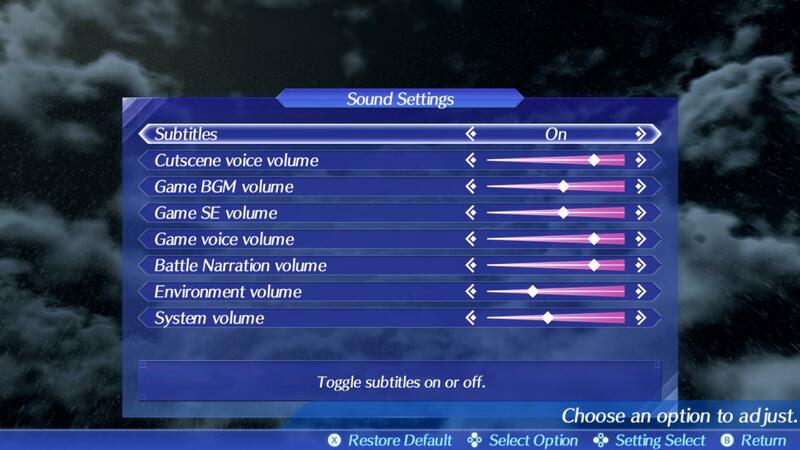 An exhaustive amount of audio settings rectify the sound balance problem from Xenoblade Chronicles X. The first few hours admittedly take awhile to get going. Numerous tutorials are laid out gradually instead of piling info all at once. XC2's beginning is a slog if you're wanting the most out of its systems immediately. Thankfully, the opening hours have their share of excitement and flair. It’s a much welcome improvement over XCX’s lackluster approach that had you digging through its thick Wii U digital manual as it abruptly let go of your hand. Once you have a proper full party up and running, the game considerably picks up and improves tenfold. There’s a sheer honesty to XC2’s tale. It is definitely another boy-meets-girl to save the world with the friends they’ve met along the way story. Plot beats are nothing out of this world in the realm of JRPGs. There are certainly a few unexpected twists to spice it all up. I’d normally find this straightforward amalgamation of JRPG tropes as a tired storyline, but its presentation is stellar enough to breathe new life in it all. It may present itself as a lighthearted story at first, but XC2 is ultimately an adventure of growing up. 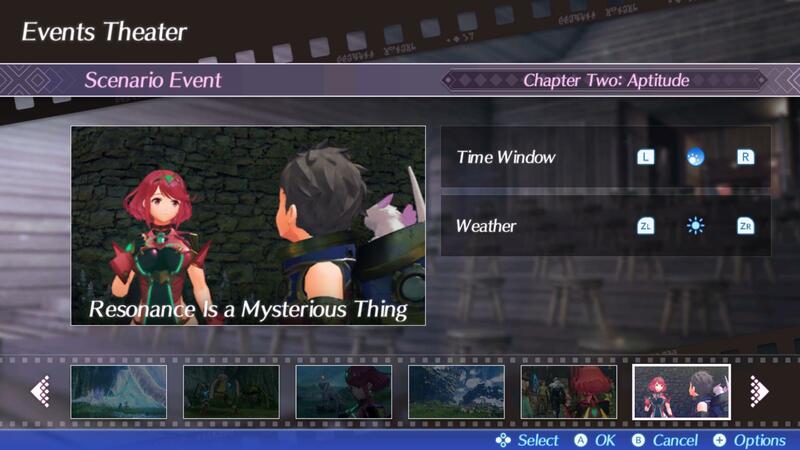 Several darker, mature themes begin to unfold the mysteries surrounding Rex and Pyra’s trip. 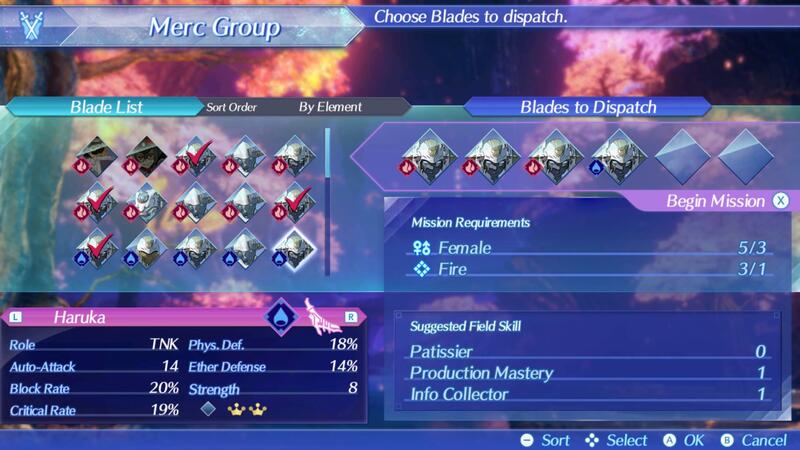 XC2 excels at presenting multiple sides for the conflicts that prop up. There are many clever narrative tricks that brilliantly expose alternative perspectives on tricky situations. Characters often have a fairly compelling reason of why they do the things that they do and I’m glad that XC2 takes the time to explore these in great detail as I was connecting the dots. There’s still an abundance of humorous, easy-going moments though. 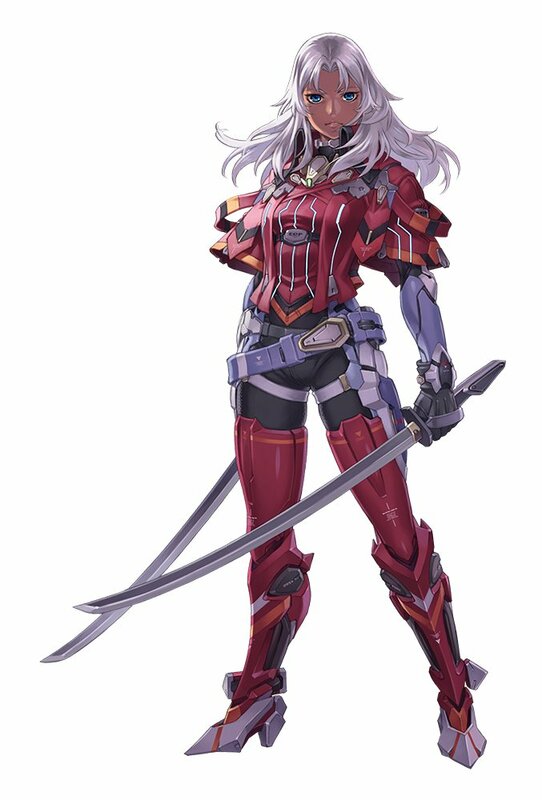 XC2’s main cast of characters are simply amazing. I found each of them to be lovable, entertaining, and interesting. 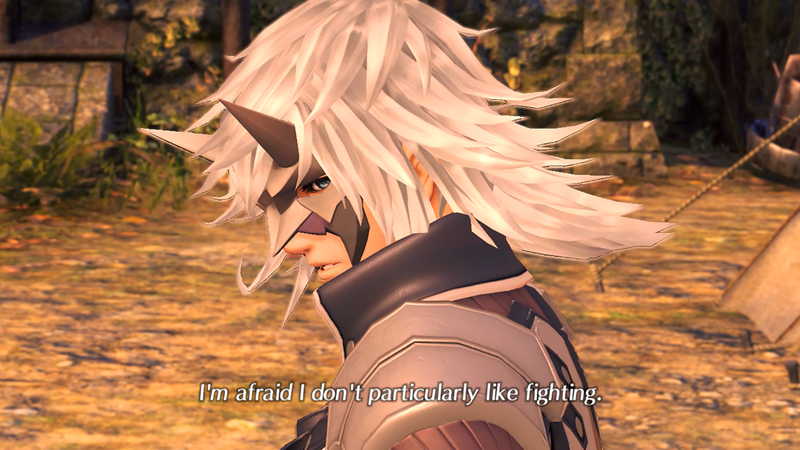 Some of my favorite moments in XC2 were the small Heart-to-Heart cutscenes that involved a couple of them speaking their thoughts on several topics. This is one of the most tightly-knit RPG parties I’ve seen in awhile and it shines splendidly. 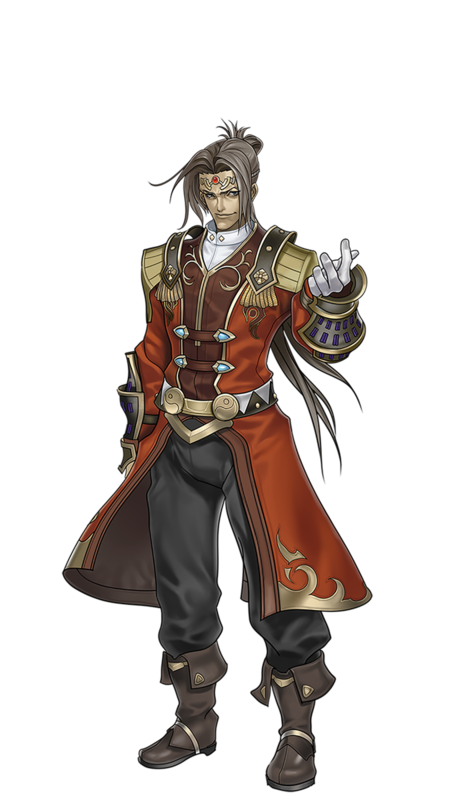 Even the antagonists are great and XC2 does an awesome job spending time building them up too. An astonishing feat of XC2 is its firm commitment to flesh out the denizens of Alrest. As I made my way to new locales on each Titan, I began to learn about how and why people lived at each of them. I learned how each nation’s political body functions and how they’ve adapted to the land conditions on their corresponding Titan. It’s an insane attention to detail. The Events Theater allows you to view past cutscenes even in different weather conditions! Cutscenes in XC2 strike a certain sweet spot that many other RPGs can’t. Snappy camerawork, visually stunning choreography, and a powerful score heighten emotional moments that get on the brink of overly sappy without overdoing it. 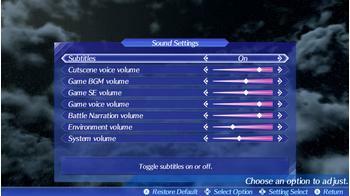 XC1’s sound team is back for XC2 and their orchestral soundtrack is a sensational testament to the game’s powerful sound design. It takes control of cutscenes and battles at just the right moment and backs off in a smooth, calm manner as you explore around. Just like in the first XC, the English voice cast does a tremendous job selling the characters. A wealth of varied accents make it one of the more uniquely sounding RPGs once more. Not every delivery is perfect, but I was quite satisfied with the English performances overall - especially given the scope of how many voiced scenes are in the game. The frequent, inadequate lip-sync to the English script is one of the more noticeable flaws. Entire lines missing their mark when a character speaks is a common ongoing problem throughout XC2. The game's Japanese voices are available on the Nintendo eShop for free if you'd rather go that route. Of course, the marquee feature that defines a Xenoblade game is its world and level design. Exploring Xenoblade Chronicles 2 both on my TV and on-the-go has been a remarkable experience. It’s a return to form from XC1; expect heavily populated towns, villages, fields, and much more. From rocky deserts to snowy mountains, it is a vivid, marvelous thing to gaze at. XC2 may not be the most graphically intensive game on the Switch, but its scope and art design are as beautiful as ever. The final stretches of the game are breathtaking to behold. Most areas seamlessly flow into one another and the only time you’ll be seeing a loading screen is when you’re booting up a save, fast traveling, or transitioning into a cutscene. It’s not one huge consistent open world like XCX, but it sure can feel like it at times. Loading times are only a few seconds long, though it comes at a cost. Fast traveling between areas often load into incomplete environments. Textures and assets will be missing more often that not, so it could look real ugly for another second or two before it fully gets done loading in. The party AI that follows you around has a nasty habit of warping around you as the game panics to logically relocate them by you; this is most noticeable when you’re traversing at uneven elevations. Each location in Xenoblade Chronicles 2 has a fresh, distinct look to them. Several technical limitations keep XC2 from being a smooth experience. It does a decent job maintaining 30fps most of the time; however, certain situations will make it start sweating. Bigger towns cause it to slow down as it was loading in bigger buildings and denser crowds of NPCs. Busier battles with lots of enemies and flashy skill effects popping off at once will cause it to chug. There were even a few instances in which the game audio would cut in and out. XC2 is an impressive game no doubt. I wonder if a few more months in development would’ve done some good to iron out these kinks. Hopefully a patch can resolve some of these glaring issues. Handheld mode on XC2 holds up well for the most part. There’s a noticeable resolution drop, but the Switch’s small screen size helps keep the environments largely crisp. Portable players will want to have power-banks handy for play sessions. A full charge dropped to a low battery warning in just two and a half hours for me after a fair mix of battles, exploration, story cutscenes, and fast traveling. 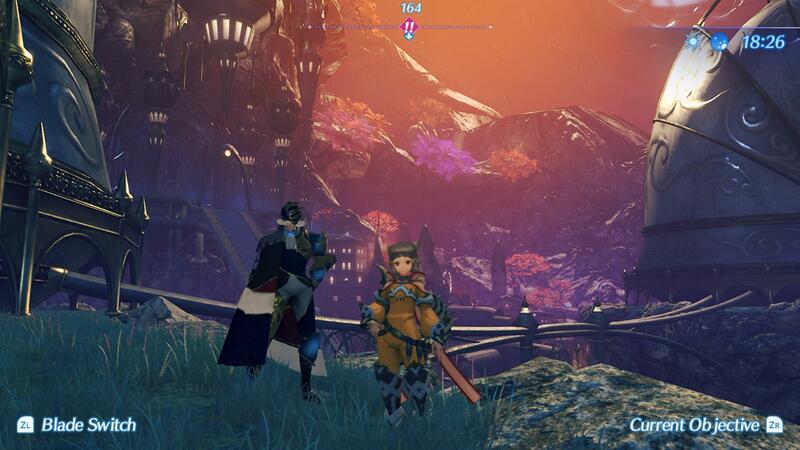 Nevertheless, roaming around XC2’s environments still feels as great as it did in the other Xenoblade entries. High viewpoints give you a brief moment to survey the lay of the land before diving in. The overwhelming sense of wonder and curiosity about each new area I encountered never failed to cease. Everywhere you run in XC2 is a new story waiting to tell your friends. 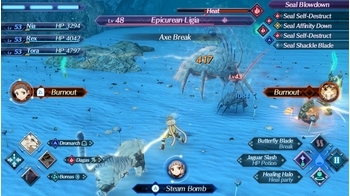 Foes of all levels lurk in every inch and in true Xenoblade fashion, prepare to run like hell from that high-leveled enemy when it sets its eyes on you. Battles in XC2 have been completely overhauled from its predecessors. It took a few hours to wrap my head around it and began to really enjoy its flow once I got a firm grasp on all of its mechanics. Parties involve a group of three Drivers that can eventually carry up to three Blade weapons each. Tora is the one exception to this because of his special Poppi artificial Blade. Blades span over ten weapon types including katanas, lances, greataxes, and even bitballs that are basically Wakka’s blitzballs from Final Fantasy X. Each weapon-type has four Arts, though only three can be equipped at once. 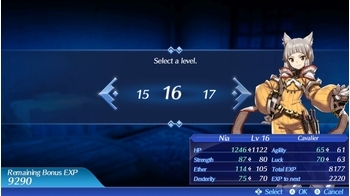 Each party member has different Arts per weapon too; Nia has a healing spell with twin rings, while Rex has a skill that deals bonus damage to Beast-type enemies with them instead. The combat UI is busy, but every aspect of it is necessary for battle. It could use some scaling down in docked mode though. Auto-attacks charge Arts which in turn, charge their fourth elemental Special skill. 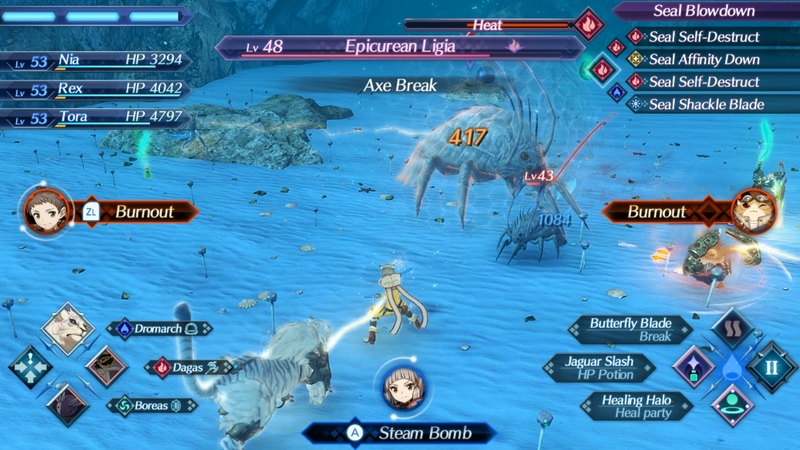 Activating this begins to stir the melting pot of XC2’s combat. Every elemental spell starts a chain of bigger and better attacks for you to decide on. In Final Fantasy terms, imagine a Fire spell that sets a fuse to a bomb. You can let that die out or cast Fira to continue it. That can still die out unless you put the finishing Firaga on it for an immense, damaging explosion. There are multiple elemental routes and mixtures to get to that explosion; the AI is generally good about switching to a corresponding Blade that’ll continue the path to get there. I do wish I had more control over my party members. The only command you can give them is to target the same thing that you’re slicing up. The most important part from this explosion you concoct is that it manifests an elemental orb around your foe. Causing the explosion with a water spell will create a water orb, a wind spell will make a wind orb, and so on. These orbs become important when you start your ultimate chain attack combo; your party members will take turns trying to break these orbs with opposing elements to extend it and drive the damage multiplier even higher. If enough orbs are broken, a devastating Full Burst attack occurs that will flat out devastate foes relentlessly. Combine that system with a series of toppling and launching foes along with keeping your party healthy - it becomes a very active high damage system. Some enemies take an eternity to dispatch if you’re only relying on auto-attacks and Arts alone, but it’s by no means a difficult system to master once you start to learn it. Plus, each Blade is assigned an attacker, healer, or tank role. These grant appropriate stat bonuses to their corresponding functions - attackers inflict more damage, tanks can accumulate aggro more efficiently, and such. This fluidly constructs XC2's class system because a character's class is dictated by what Blades they have equipped. 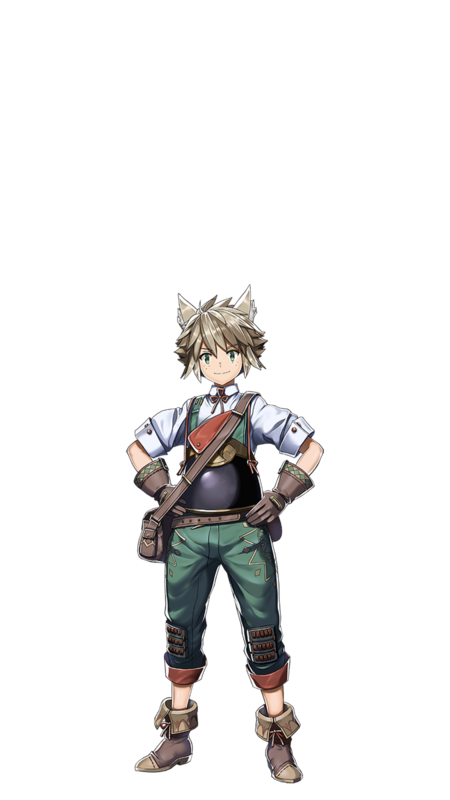 If Rex equips three attacker Blades, he'll become a Master Fighter which vastly increases the damage he deals. 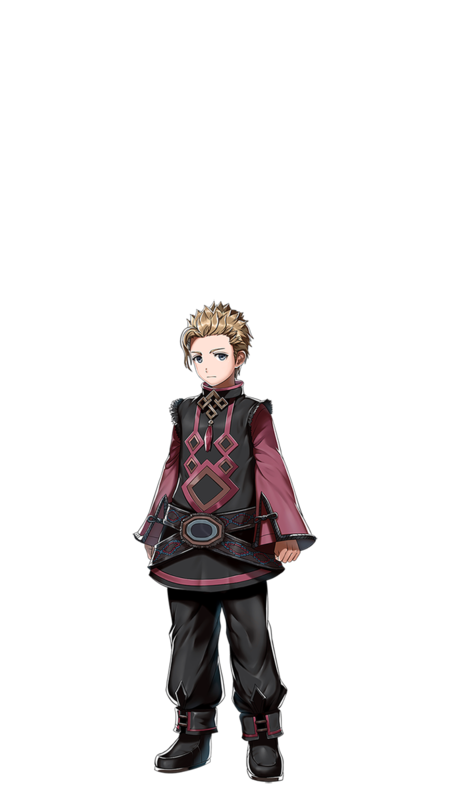 Switching two of those attackers to healers would turn him into a Holy Cavalier instead; he now does a bit less damage in exchange for HP potions healing him more and builds up less aggro as he attacks. It's a smart, non-intrusive way to distinguish what you want characters to do in combat. EXP rewarded in quests are put in a bonus pool. You can use them when you rest at inns to indicate if you want to and how much you want to level up. Acquiring new Blades involves opening Core Crystals, though a few are rewarded from specific sidequests. These crystals are essentially loot boxes. You cannot purchase them with real money at all. They are only obtainable in-game and have common, rare, and even legendary variants to them. 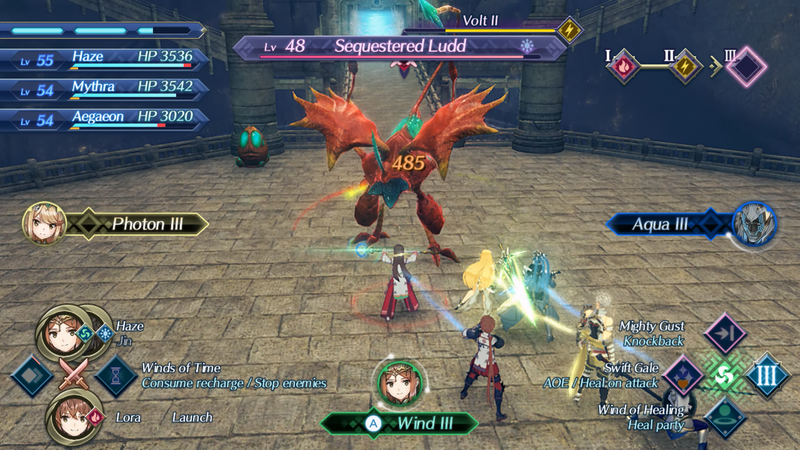 Blades are both weapons and actual living beings; Pyra is Rex’s Blade and wields the Aegis Sword. Blades can only be used by the Driver that opens them. 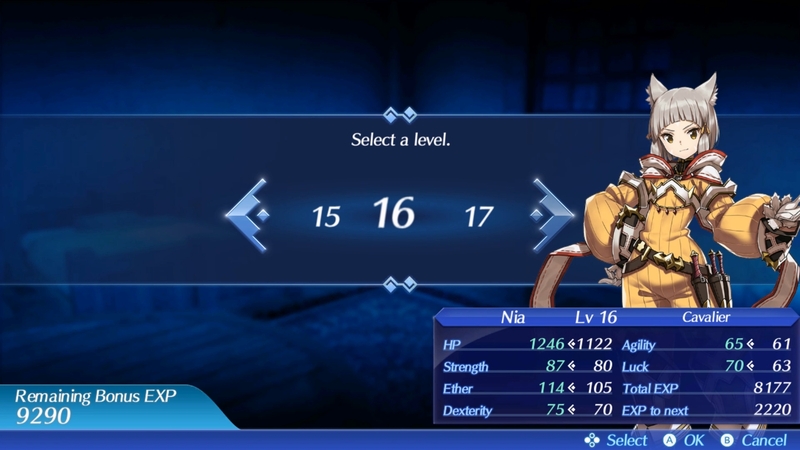 If Rex obtains a Blade, he can’t normally transfer it to Nia. The only way to transfer a Blade to another Driver is through the rare Overdrive Protocol item. As you might expect, there are a handful of extremely special Rare Blades that can be rolled in crystals. They can show up in commons, rares, and legendaries… but so can generic Common Blades too. Yes, even in the small amount of legendary crystals you’re given too. Opening crystals steadily becomes an arduous process. It’s an exciting thing to see at first. Then you start amassing a lot of crystals and next thing you know, you’ll be spending long stretches of time using them one-by-one. There’s no way to open them in a batch and no way to skip the animation of opening them. As soon as you select a crystal to open, the game will save right away (to prevent save-scumming) and cycle through three Blade silhouettes in that crystal. You’ll always obtain the third one and you can bet you’ll be tantalized with those Rare Blade silhouettes that you just missed. It’s a baffling mechanic that still tortures me; I think it’d be slightly more tolerable if I could at least open more crystals at once. Common Blades are not necessarily gimped in combat; they can still use all of a weapon’s Arts and Specials. The real alluring part of Rare Blades, apart from looking real cool, are their expansive affinity charts, field skills, and exclusive sidequests that come from several of them. 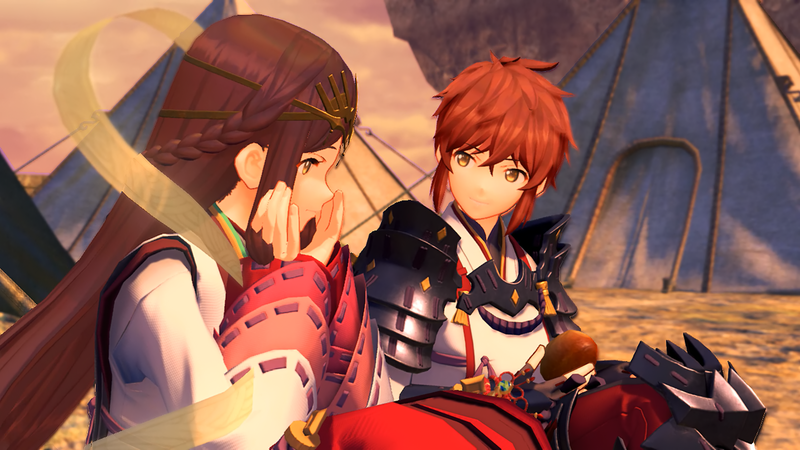 Rare Blades are also in several Heart-to-Heart scenes too. Field skills in XC2 largely make up its environmental puzzles. They’re not inherently bad; the idea is using your vast array of Blades’ specialties to overcome a task together. A locked treasure chest may require four levels of lockpicking and three levels of super-strength to open. 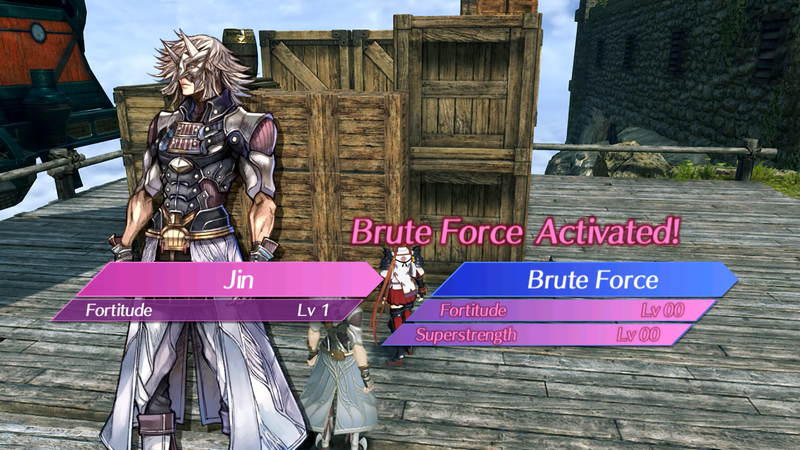 If no one Blade possesses those appropriate traits and levels, you can equip two Blades with two levels of lockpicking instead and other Blades possessing super-strength on another party member to open it. Sending out mercenary groups to complete tasks is a great way to make use of your excess Blades. These will reward EXP, gold, and even new items in shops. I found this quickly becomes a chore to swap appropriate Blades in-and-out to overcome these obstacles only to switch them back to my main combat Blades again and again and again. It’s a weird oversight that I, once again, hope that it sees a patch to rectify. Ideally, my wish is that it would account for your entire Blade inventory instead of this vicious cycle of equipping Blades, especially where there’s no hot-swap option on the fly to do it. Expect to do this for many sidequests during your travels. Sidequests in XC2 are a bit odd at first. They make a weak first impression with simple strings of gathering and rescuing duties. Basic ones no longer auto-complete themselves on the field either, since there's usually some follow-up flavor text from quest givers. Then at some point, sidequests branch out into much more involved affairs. A bunch of therm serve as small, delightful insights into how people live in Alrest. XC2 is usually good about indicating where to go next in them, but there's still the usual suspects of hard-to-find materials that you'll need to seek out on your own. Reporting back to quest givers is easy enough thanks to the elegant quest log snapping a screenshot of them and the map showing where they are when it's time to visit them again. 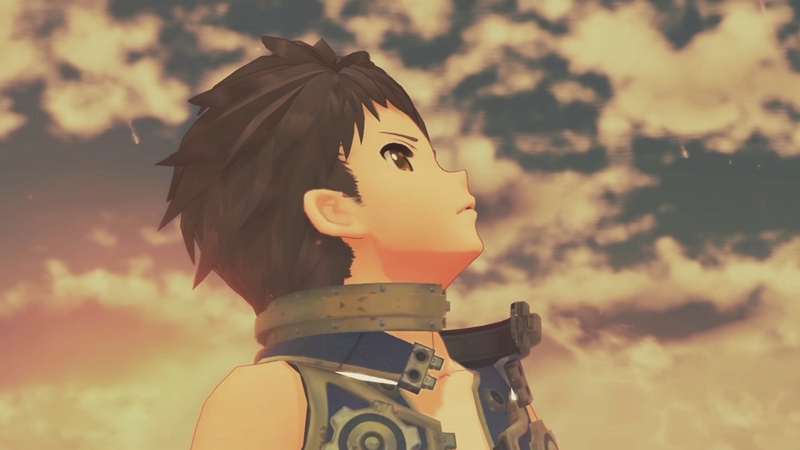 Monolith Soft’s transition to a more cel-shaded artstyle for XC2 benefit it greatly. It undeniably flexes its anime inspirations with its new visual direction, yet it doesn’t lean too hard on the gratuitous side that industry has become largely known for. There are several character designs that will raise eyebrows, but I didn’t find it all that distracting the more I played the game. 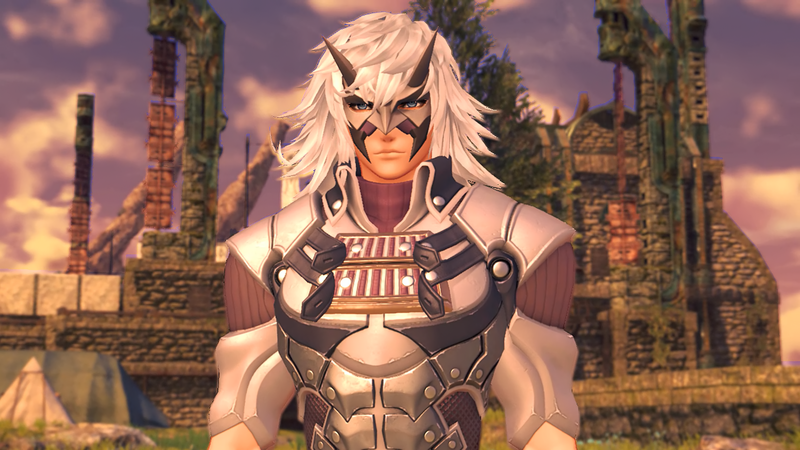 It is a bummer that you can’t alter the appearance of your characters with armor, especially when past Xenoblade games allowed for it. In fact, there’s no armor system in XC2. You can only equip accessories to your Drivers and Aux Cores to your Blades to bolster their offensive and defensive attributes. Core Chips buff the attack power of your Blades and can sometimes alter their weapon designs. An excellent story, a lovable cast of characters, an exciting battle system, a phenomenal soundtrack and of course, an incredibly dense world to explore. However, there’s a wonderful blend of artistic freedom in XC2. 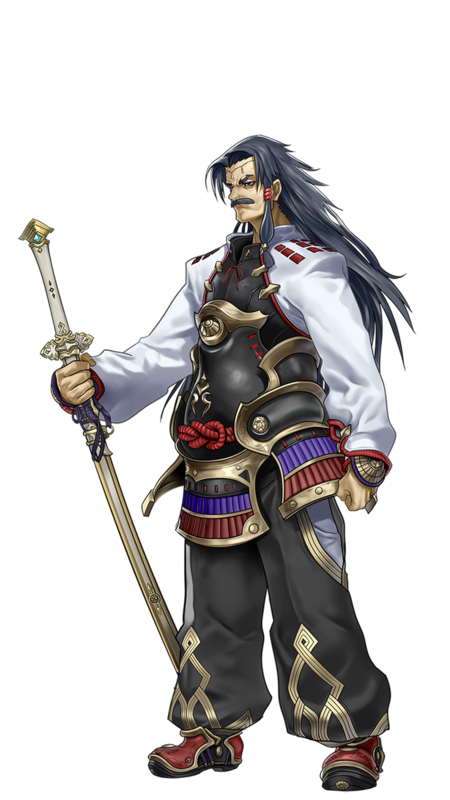 The main cast and antagonists have different artists; numerous Japanese guest artists were also brought on board for each of the Rare Blades too. Their portrait illustrations hugely contrast from one another, but XC2’s graphical engine does a fascinating job consolidating their designs to be more consistent with each other. Sometimes cutscenes do highlight the minor glaring issue of character models clipping into their outfits though. 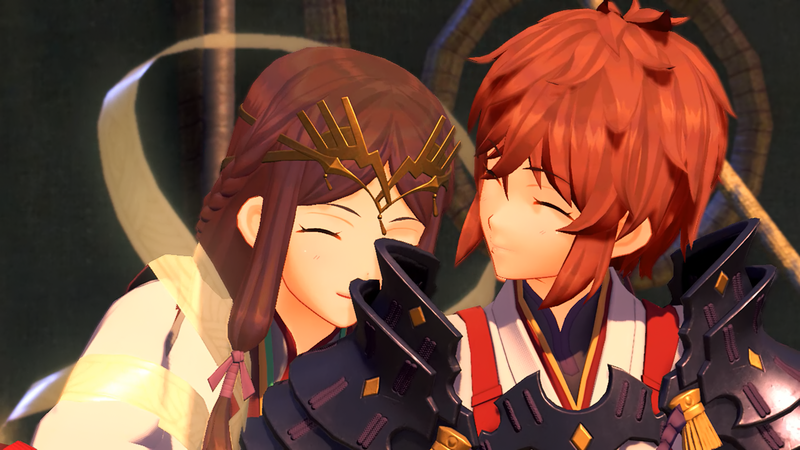 The best thing to come from Monolith Soft’s decision with XC2’s art direction is their expressiveness in cutscenes. They’ve finally found a style that allows them to tastefully convey facial expressions and body language without being hindered by underpowered hardware or a confused, semi-realistic palette. Characters are able to show that they're full of life and the cutscenes take full advantage of it. Xenoblade Chronicles 2 is an extraordinary game that stays true to the ideal, classic RPG experience. Monolith Soft has meticulously crafted a typical boy-meets-girl and save-the-world story into an endearing tale that feels fresh. The amount of thought and work put into the world of Alrest is jaw-dropping. It’s masterfully put together with incredible cutscenes, a charming cast, a thrilling battle system, and an exceptional soundtrack. Technical performance issues and a troublesome method in acquiring new Blades blemish the experience a little, but no JRPG fan should give this a pass. This year has brought us a great deal of superb RPGs and Xenoblade Chronicles 2 magnificently stands tall among them to close the year out with a bang.